Well, hang on for a moment because it’s about the thinking, not about the process. So, if you had a property and you were going to get a concrete driveway, what would most of you do? Well, most of you would ring up some companies, get a couple of quotes, probably go with the cheaper or cheapest one and you would end up with a driveway that’s probably done cheap, it’s got a crack in a few years and all that sort of stuff. Hey, I’ve seen it done before, I know family who have done it. Well, this story comes from Christmas and my brother-in-law’s brother. Actually, his family lives out in the western suburbs of Sydney. Now the western suburbs of Sydney have some very large acreage to this day, basically a lot of it very, very rural. And they have a lot acreage out there, so it might be 5 to 10 acre lots, whatever. So we’re going to draw just a big square block like this and we’ve got a house up here. But what they’ve got is a very little driveway and it’s about 300 or 400 meters from the house that’s been built, but there’s no driveway there and they want a driveway. This driveway, quotes have come in between $60,000 and $100,000. You could pay more for it depending on how thick and how professional you want to do it. So he had an idea and a thought. They didn’t want to blow that money on a driveway, but they wanted a driveway, especially being rural, you know, it rains and gets dirty, all that sort of stuff, protect your cars, add barrier to your land. So he rings up the local concrete company. Now what happens with a concrete a company, is that they can’t under-deliver concrete for a job. So what happens is they always have to have enough or more, which means at the end of the day or a job, they almost always have excess concrete. Have you ever wondered what they do with that concrete? Well, clearly they’re going to have to dump it, wash it down the “drain”, so to speak or get rid of it somewhere. So what he did is he rang them up and said, “Listen, I’ve got a long driveway. It’s in the area where you work and what I’d like to do is get my driveway concreted and I’ll take the excess concrete that you would have to dump or pay to get rid of,” or whatever they do with it. So what happens is, he gets a call at the end of the day and they come and say, “Look, we’ve got a couple tonnes of concrete left,” and they will do the first bit of driveway here. And that’s all done and then that’s it. He’s there, he’s got a, you know, “trail it off”, for one of the better word, level it off and do all that sort of work himself. But he can do that because he’s in the local area and it’s usually at the end of the day. Then another day or a few days later, they ring up, and there’s another section and another section. Then on occasion he might do a different section of concrete and a different bit, and this takes time and it takes a few months. But hey, at the end of the day or at the end of the months, he’s got a $100,000 driveway for free. This adds massive value to a property and it’s a real concrete driveway, it’s going to last for a long time. If he’s not happy with the colors, you could tint it, you could paint it, you could do a few things to it. Anyway, that’s how you get a $100,000 driveway for free – by thinking differently. So this is not about the driveway, it’s not about the money. It’s about how to think differently. Many of you have probably never considered that idea that I’ve just given to you. But you know that exists in basically every industry on the face of the planet. Now I talk about making money in four areas: property, business, internet, and shares. This can work in any one of those areas if you get creative enough in your thinking. 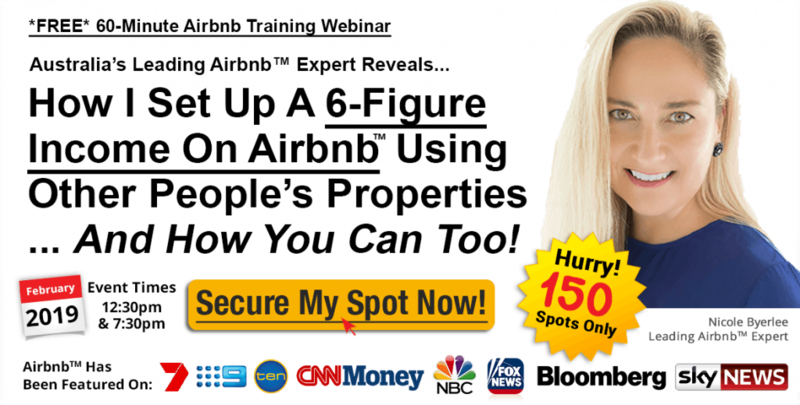 The most obvious way I can think of this right now is with property and, in particular, this phenomena called Airbnb. It was my number one pick in 2018 and I think it’s my number one strategy in property in 2019. And it’s just getting huge and it’s going mainstream. Even the agents I talk to now; I talked to one on the weekend up on the northern river in New South Wales, they’re now going to move out of their house and rent it out on Airbnb and they’re going to move to the coast to live by the beach. And this is a real estate agent! So you can see this has got massive potential. But anyway, the traditional way of properties, people think they’ve got to slave away in a job, pay exorbitant sums of tax, save up, scrimp, and save a little bit of cash to get a deposit going, beg to a fraudulent bank to loan the money that they didn’t have in the first place, and then they buy a property and pay it off for the next 30 years. Well, that’s old thinking, ladies and gentlemen. That is so 2017 thinking, it’s not funny. It is 2019 now, at least depending on when you’re watching video. There is a new way the game is played and Airbnb is showing that. Hey, we go to a landlord, probably a property investor. They’ve got a property, they’re trying to lease it out or they’re sick of renting it out. They’re sick of tenants, they’re sick of landlords, they’re sick of paperwork, and they’re sick of bills and all that sort of stuff. A lot of people emotionally are not set up to be property investors, don’t want the hassles and all that sort of stuff. You know what, a lot of people are saying, “Yeah, sure, take care of it.” You want to know why? If you have ever dealt with a real estate agent, have you seen the service? Have you seen how many of them they treat tenants like criminals? Have you seen the absolute attitude that comes from these organisations? If you’ve rented, you know what I’m talking about right now and you’re nodding your head. It doesn’t matter how wealthy you are. All are treated the same. Anyway, so what we do is we aim to find properties that meet our criteria and let’s say it rents for $600 a week. Our goal is to make $600 a week on top of that – free cashflow renting out an Airbnb. So this is pretty cool. No deposits, no stamp duty, no mortgage insurance, no tax, no accountants, no nothing. None of that stuff is involved. We just go direct to our landlord, we rent it off them through a commercial lease and then we re-rent commercially night-by-night on Airbnb aiming to make that. I tell you what, it can cut a 30-year journey down to 30 days and we’re making phenomenal cashflows, aiming to make $2,500 grand a month on the ideal standard sort of property. But there’s no such thing as a standard property. But anyway, that’s an idea of new thinking applied to a standard way of investing and it will set you free very, very quickly and huge sums of cash flow can be yours. I hope you enjoyed that success tip. Maybe you want to take a moment and think about how a different way of thinking can apply to what you’re doing or what you’re trying to do because let me tell you, ladies and gentlemen, resourcefulness will trump resources any day of the week. This is Stuart from Zadel Property Education and I’ll catch you next time. Bye for now.